Forrester Research has been heating up the marketplace lately with a string of interesting reports and forecasts that impact CRM and the front office generally. One that I saw, “Capitalizing on Live Video Chat” by Diane Clarkson, August 23, 2011 talks about the bright future of using video rather than text (obviously) chat in sales, service and support. Another report out just last week “Social Enterprise Apps Redefine Collaboration,” speculates that the social software market will be worth $6.4 billion in 2016 up from a mere $600 million last year. I read about the report in a PCWorld article by Juan Carlos Perez of IDG News. “Simultaneously, demand for unified communications and collaboration (UC&C) products that offer IM, audio calls, online meetings and video conferencing, will start to drop overall in 2014 because, unlike enterprise social software, they don’t help employees discover peers outside of their work groups with expertise they need to tap, according to Forrester’s report “Social Enterprise Apps Redefine Collaboration,” published this week. In other words you have to assume straight-line continuity from today through the period you are forecasting. Good luck with that. Our recent experience with “Black Swans” is enough to tell us that straight-line projections are feeble at best. I’m not saying the people at Forrester aren’t hard working or sincere in their research. It’s just that this kind of prognosticating can go to Hades in a handcart without much of a push. Still, for most things it’s the best that we have. But back to that quote. My reading of the tea leaves says that UC&C will not shrink at all and will most likely grow after possibly being repositioned, here’s why. It appears that the analysis may not take into account the escalating price of gasoline and other transportation fuels. Fuel prices drive the economy these days because there is no slack left in the system. In prior decades when supply got tight prices might have gone up a little but then producers, seeing opportunity for increased profits, began pumping more oil and exploring for even more but that’s over. So my view of the future is a bit different. I think it is entirely possible that the social software market will overshoot the $6.4 billion projection (by an integer factor of 3 to 5) and that UC&C isn’t going anywhere but north. The two technologies do different things and there is a market for both. While social software is becoming invaluable in sales, marketing and service, UC&C will, I think, grow into a niche that is still expanding. According to Steiner’s book, as fuel prices continue to escalate we will find our travel options reduced meaning fewer connecting and short distance flights and that will drive demand for online meetings and video conferencing as well as online conferences. We’ll drive more but at, say, $12 bucks the SUV/land ark will be a quaint part of history and we’ll drive only when necessary replacing face to face meetings with virtual meetings. Add to that the much lower costs for telecommunications services that UC&C can provide and I think we’ll see increased demand for these systems. You might think that the cost of transportation could simply be built into a company’s pricing models and that those costs would simply be reflected in higher prices. But that approach will simply drive an inflation spiral and make everyone’s products unaffordable. Transportation is going to eat into margins and the only way to fight the inevitable is to reduce demand for energy in your business processes. 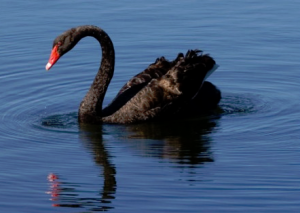 To summarize, energy prices and energy availability are the Black Swan in our future. Straight-line projections are often helpful for sorting out the future within a paradigm but we are entering a new paradigm. In this case projections that do not take into account the cost of energy will only provide a false sense of security. Worse, they can cause us to sleep when we ought to be planning and implementing solutions for a very different future.